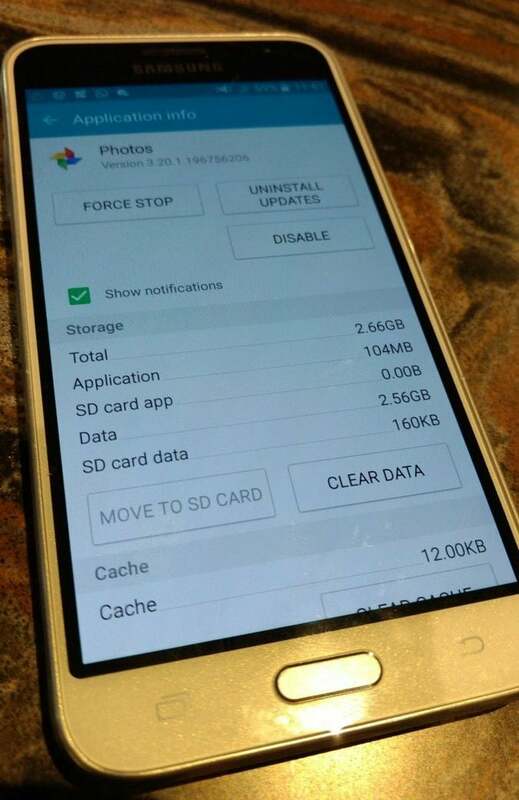 This Samsung phone has 8 gigabytes of internal storage. The system files consume about a third of that space. Preinstalled Google and Microsoft apps take another third. Google Photos keeps gobbling up the remaining storage space until the phone becomes unusable. There is no option to configure Google Photos to put this data on an SD card; it insists on using internal storage memory. On my Android devices that have more storage space, Google Photos consumes nearly 4 GB of space. This is not the space consumed by my photos on the device. This is space consumed by the Google Photos app data. I assume this is for storing thumbnail and index information for the thousands of photos and videos I have stored in Google Photos.